Here is the link to enroll into the ModeraCare Telemedicine program. ModeraCare is not a health care provider, but it has partnered with MeMD, a leading telemedicine provider, to offer you virtual access to MeMD'snetwork of independently contracted, board-certified, licensed health care providers. These health care providers -MDs, DOs, NPs and PAs -are licensed in the state where you are located and will be able to treat many routine medical conditions over the telephone or through online video chat. † When medically necessary, MeMD providers can submit a prescription electronically for purchase and pick-up at your local pharmacy; however, MeMD providers cannot prescribe elective medications, narcotic pain relievers, or controlled substances. 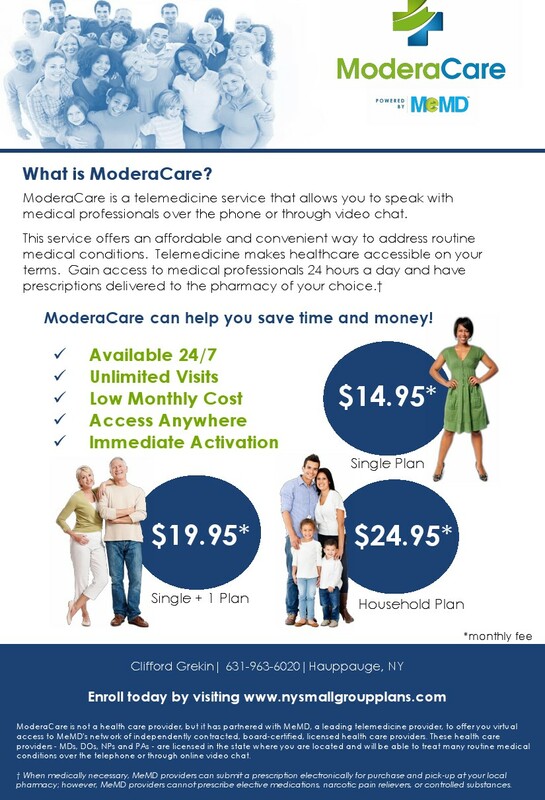 ModeraCare can help you save time and money! ModeraCare is a telemedicine service that allows you to speak with medical professionals over the phone or through video.